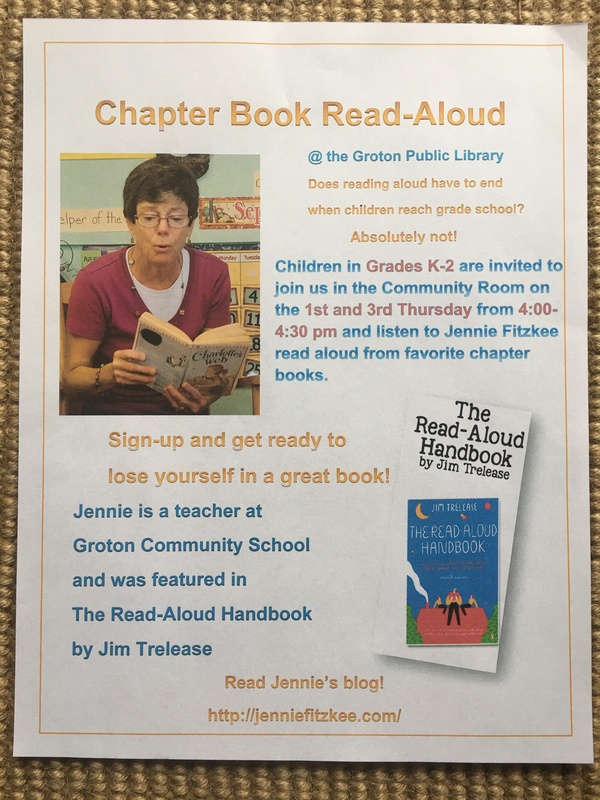 I read aloud every day in my classroom, and weekly at the library. Picture books are a mainstay, yet reading aloud chapter books can move the world. Are you surprised? Don’t be. Thirty years of reading Charlotte’s Web is proof, my proof. Every year former students return to be a guest reader. I don’t invite them, they want to come. Their parents pull me aside to tell me their child has become a voracious reader. Many return as high schoolers to volunteer in my class. If I go back to when they were preschoolers in my class, glued to chapter reading, their favorite book every year was Charlotte’s Web. At the end of each school year we vote on our favorite chapter book, and the winner is always Charlotte’s Web. Always. Yes, I know. I read Some Writer by Melissa Swift. He’s Andy. If you want to know everything about E.B. White, it is the book. Far from a typical biography, it tells the reader as much about the books he wrote as it does about his life. It is terrific. Charlotte the spider would applaud that word. I was out of town and unable to attend the event. To say that I was devastated is an understatement. Perhaps E.B. 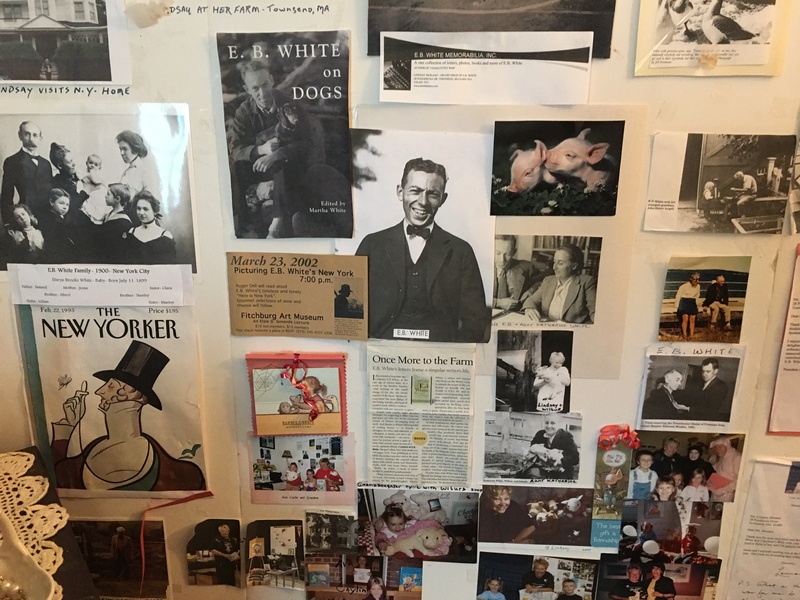 White’s grand niece would see the library poster on their bulletin board in the entrance of the children’s room. Gee , no surprise here that the book I am reading on the display is Charlotte’s Web. A week later, after the big event, the librarian said, “Jennie, E.B. White’s grand niece (Lindsay) would like to meet you. She knows about you, and has heard about how you read aloud Charlotte’s Web.” Well, that’s about the best invitation I ever had. And so, with a note to me that was addressed, “Salutations, Jennie!”, I was invited to her farm for a visit! Lindsay’s grandfather was E.B. (Andy) White’s brother, Albert. He was the keeper of the letters and memorabilia (most went to Cornell University). He cared. Lindsay inherited her grandfather’s genes, and also much of what he kept. Albert was one of six children. His brother, Andy, was the youngest. Lindsay has the same look and expression as her grandfather in this photo (second from the right, bottom row.). Andy is the baby. And there I was, standing in a room filled with E.B. White memorabilia. And, with E.B. White’s grand niece. Humbling and exciting. Words escaped me. I felt like Wilbur. First, there was the typewriter, an Underwood, upon which Andy wrote his books. I don’t know about you, but seeing and touching that typewriter, something real and dear, was a piece of heaven for me. 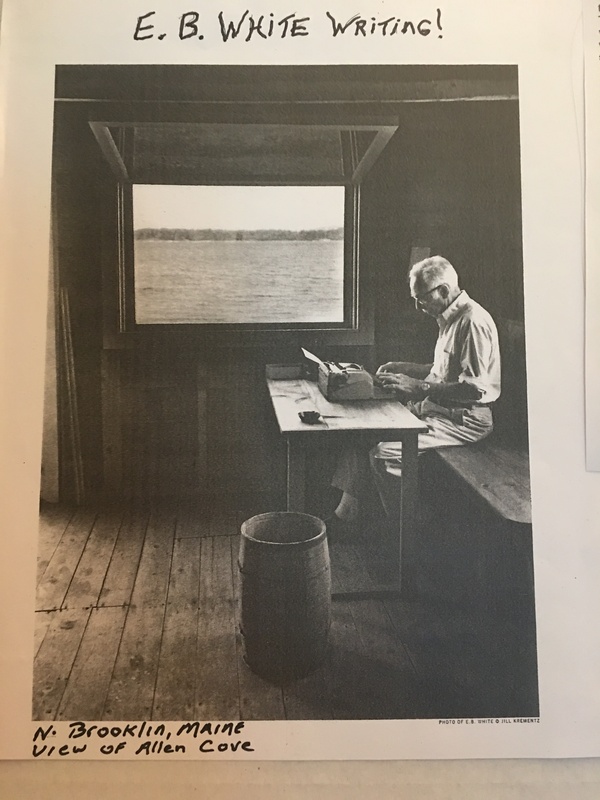 Perhaps this plethora of photos and articles gives you a clue as to the volume of fascinating artifacts over many decades, from the cover of The New Yorker magazine where he worked much of his life, long before he wrote children’s books, to letters and family photos. Look closely at the photo of Andy and his wife, Katherine. She was the love of his life. I knew that from reading the book. We talked a great deal about Charlotte’s Web. “Would you like to hear a recording of Andy reading the book?” Lindsay asked. “Of course!” I said. As we listened to the opening of the book, I found myself whispering the words I knew so well, along with Andy. Yet, I was surprised to hear how he read the story. ”I don’t read aloud the words like that at all. His voice is calm and steady. Mine is emotional.” And so I recited a few sentences aloud. Lindsay smiled. I did not know that. It makes perfect sense. E.B. White is Wilbur the pig, and his beloved wife Katherine is Charlotte the spider. 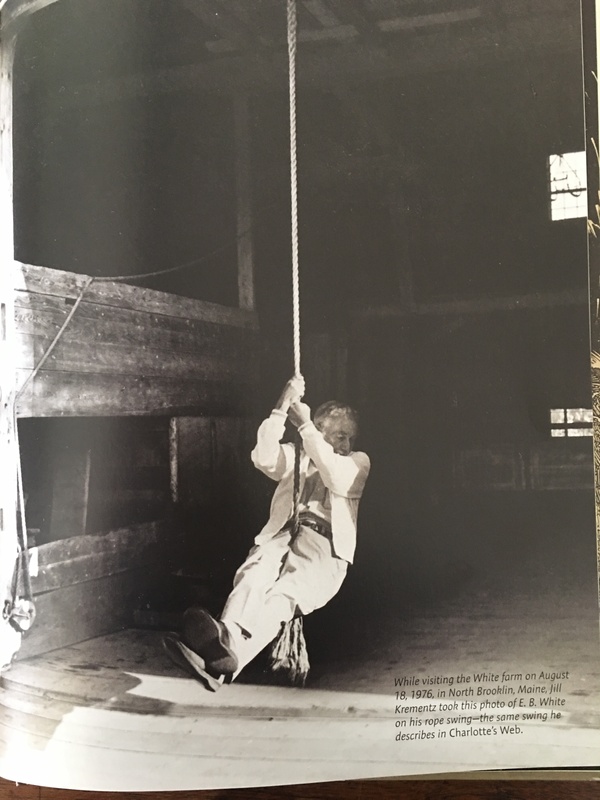 I leave you with two of my favorite photos, the boathouse and the rope swing at the house in Maine. Salutations! This entry was posted in Book Review, books, chapter reading, children's books, E.B. 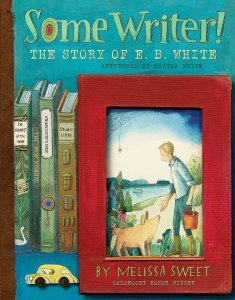 White, Early Education, reading aloud, reading aloud, Teaching young children, Uncategorized and tagged chapter reading, Charlotte's Web, E.B. White, Melissa Sweet, reading aloud, Some Writer! The Story of E.B. White. Bookmark the permalink. BTW, I often quote “I’m sorry Avery, but Fern was up at the break of dawn ridding the world of injustice, and I only distribute pigs to early risers” in our house. 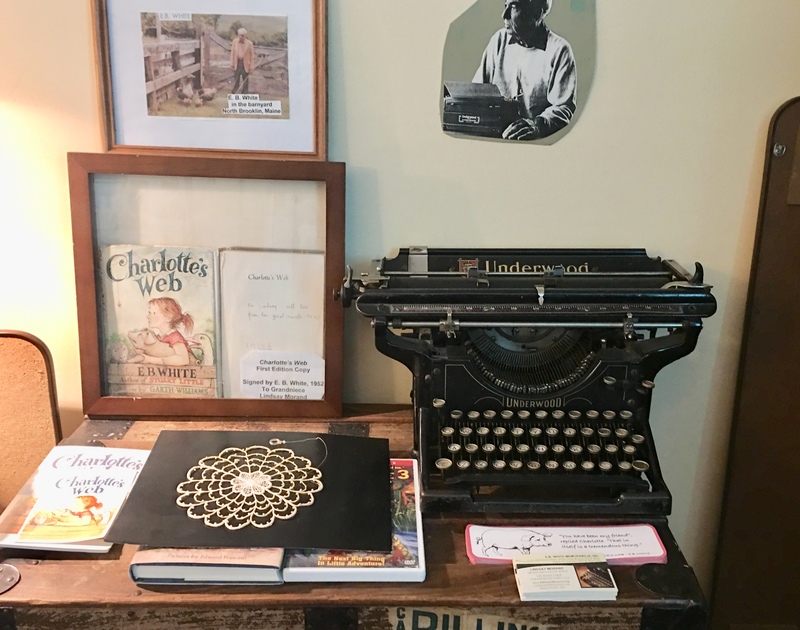 I can just imagine your joy at the visit; seeing the memorabilia, and the actual typewriter! Hearing the story from his own family was the icing on an already delicious cake. It was indeed, Pete! Many thanks and best to you. Wow what an opportunity! That’s pretty neat. How wonderful to meet someone from his family. What a great experience for you. I love the pictures and how he used his relationship with his wife to create a strong bond between the two main characters. Knowing more about the author often gives more meaning to the story. All those wonderful stories and memorabilia definitely give the story so much more meaning. Thank you, Darlene. It was truly a treat for me to be there. If you love Charlotte’s Web like I do, you’ll love this post. Incidentally, I had a conversation with one of my nieces about this book just this week. She’s grown now but when she was a kid she took my copy of Charlotte’s Web from my book shelf and I let her because I wanted to encourage her to read. Of course, she never read it and I never got it back…and I miss it (like I could buy a new one but it wouldn’t be the same). She asked me to rec a book this week; guess which book I recc’d. Is a part of me hoping that she’ll dig up my copy of Charlotte’s Web from where ever the child-version of herself buried it and return it (after reading it of course)? … Maybe. Wow! This is truly a great post, Jennie! I can’t imagine how you felt during that visit. Thanks for sharing these precious moments. Not just lucky – you earned that invitation! What an amazing story, Jennie. Charlotte’s Web is a book I have also read a number of times and I just love Wilbur and Charlotte. I’m so glad you enjoyed it, Robbie. It’s such a wonderful book. Thank you! Oh my! Jennie this is just amazing! From the short while I’ve known you I know how important Charlotte’s Web is to you. How touching to have that personal invitation to see something that means so much to you!!! Thank you, Chelsea. Much appreciated! What a great post. Reading out loud is do much fun. I can understand why this is the favorite every year. Thank you so much, Dan. I’m really glad you enjoyed it. What an amazing experience and well deserved honor! I recently began chapter reading with my 4 1/2 yr. old grandson, Benjamin. The book…Charlotte’s Web! I have memories of reading this beloved book with my son and two daughters decades ago. I had to purchase a new copy, as the first copy is worn and falling apart from many years of use. The first copy resides on my oldest daughter’s bookshelf along with her other favorite book, Heidi. Thank-you! Thank you for your kind words and for sharing your own story, Ellen. It is staggering to think of how many people, children and adults, Charlotte’s Web has influenced. What a wonderful thing! I so enjoyed this today! 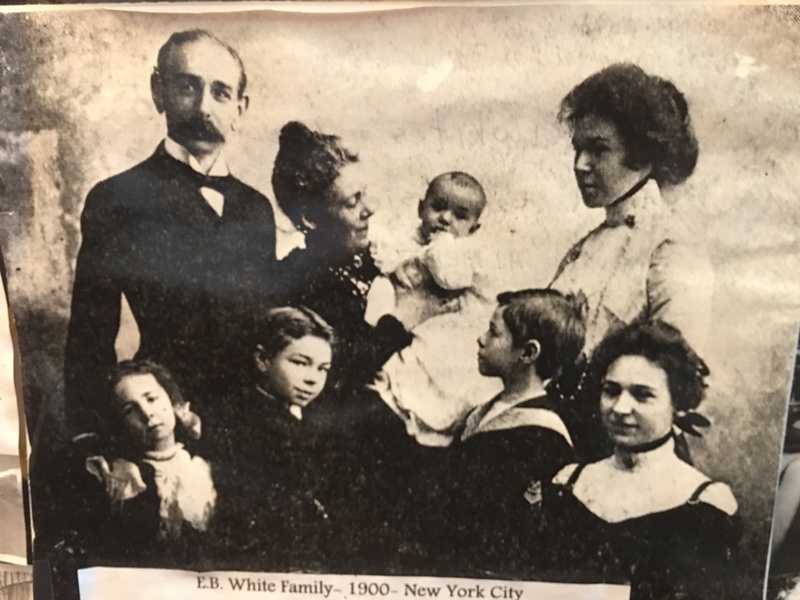 Thank you for sharing this lovely and very personal story of EB White and his family. I also really loved reading about how your students came back to thank you, became readers, volunteered. Such beautiful ripples. =) ♥. Hey Wilbur, looks like you fit right in and felt right at home! I did 😀! Thank you, Laura. Love, Wilbur. What an opportunity, and her book sounds wonderful! Oh my that must have been amazing!! I read Charlotte’s Web as my last read aloud every year and the children do love it! It was amazing, AJ. I’m so glad you read it aloud every year, too. The best! Jennie, that is so awesome. I could hardly read your post for the tears in my eyes. If I felt emotional reading it, I can’t imagine what you felt experiencing it. Such a wonderful book with so many wonderful lessons told in such a heartwarming way. Finding out a little more of the background to Andy and his story makes it all the more special. Thank you for sharing with us this wonderful reward for your efforts in opening the hearts, eyes and minds of children. A memory to treasure forever. That is so nice, Norah. Thank you! It was certainly one of my best experiences, adding more depth and meaning to something I treasure. You said it very well! When school begins in the fall, she wants to listen to me as I read Charlotte’s Web to the children. Isn’t that something? Wow! How cool is that! I used to teach Charlotte’s Web a LOT in my college children’s literature course. There are so many wonderful things about that book, most especially SOME PIG! Thank you, Luanne. It was amazing. I loved being surrounded by E.B. White and learning more about my favorite book. It was TERRIFIC. LOL but t I bet he was a HUMBLE man. Thanks for sharing the grand photos of an amazing writer! I also loved that poster of you, Jennie. Thank you! It was a special moment, indeed. What a treasure to know that White was Wilbur and Charlotte was his wife. Thanks for sharing this experience with us. Yes!! I was speechless to learn that, too. I’m so glad you you enjoyed this, Bernadette. Jennie, Charlotte’s Web is one of my all time favorites. So much goodness and wisdom shared in his book. Well, now when I read this to my seven-year-old in the fall, I’m going to be crying buckets! What an amazing experience for you! Aww… they will be wonderful tears to cry, Elihu. Thank you! What an experience. I’m jealous but oh so happy for you. Those inside stories really bring the life and goals of writers alive. You are so right, Jacqui. And I was lucky to have the experience. When I read the book aloud in September, I will always think of E.B. (Andy) as Wilbur. oh my! What a wonderful experience-the beloved Charlottes’ Web-oh I am so very glad this happened for you! Now, I will cry more at the last chapter myself! thank you dear Jennie-It couldn’t have happened to a more deserving person. Thank you for your kind words, Michele. Much appreciated! It was truly wonderful. When I read the last chapter, I will cry, too. And the children will understand, because we’ll have so much to talk about. Know what I mean? Life is good, and tender. Well I never knew that. What a brilliant experience. I always read ‘I Am David’ to children in my class and however many times I read it I always had tears in my eyes at the end. Books are wonderful and when you find one you love it stays with you forever. Thank you so much! In all my years of reading the book, I did not know that either. I’m so glad you had the same chance to read a terrific book to children and make a difference. Just wonderful! Love this!! Charlotte’s Web was my favorite as a kid and in my college children’s lit class I had to do a project on a children’s book for a 20 minute oral presentation. I chose The Trumpet of the Swan and still remember a lot of the research I did on its author. Still one of my favorite college memories 30 years later! Skimmed thru your final draft. It sounds much more authoritative and look s better too. Like the Appendices at the back. Really shows what you mean. I’m forwarding this blog post about E.B. White author of Charlotte’s Web thought you might be interested in especially the last 5 paragraphs. It also came to me after I skimmed your paper that Jenny Wagner may have based the main character in the Bunyip of Berkeley’s Creek on a platypus since she had never seen a bunyip. Melbourne was great. Lots of good experiences and feelings. What an unforgettable opportunity. Thanks for sharing. An excellent post once again. I so enjoy the photos and backgrounds of the writers and the fact that you are making these introductions. 🙂 You are making some special memories and I do believe a good number of devoted readers. Thank you so much, Lea. I so appreciate your words. Your posts and the thought of a teacher such as yourself, delightful. Have you ever introduced children to The Little Prince, Antoine Saint de Exupery? Wonderful to hear. Thank you, AJ. Charlotte’s Web is such a great book and reading aloud is so important. Amen! Thank you for your words of wisdom, Opher. Such a touching backstory, Jennie. And how wonderful to experience it in such an up-close-and-personal way. Thank you, Mitch. I’m so very glad you enjoyed the story. It was wonderful, indeed. Your words are much appreciated. danke für die Info, mache es gut. I hear ya, Jennie. I too, would love to ‘touch’ that typewriter! It holds the consciousness of the user. Sounds like you ‘felt’ that. I am so, very excitedly elated for you! How fulfilling your experience must have been. You are extremely deserving of this, and so much more! Wow. I love the backstory between Wilbur and Charlotte. I have tingles. It’s one of my favorites that I’m starting to read to my four-year old now. First of all, Jennie I am not surprised about this newest adventure! You are worthy of so much, including your state experience. This is SOME grand invitation! They are so sweet, hold hands and took me to see, Anton Chekov’s “The Seagull.” It was much better depicted in film format, by the way. What a special time you’ve had! 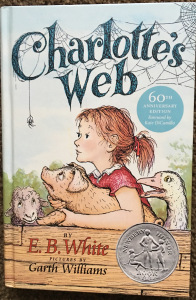 Charlotte’s Web is one of my favorite books, too, and I’m always recommending that particular audio version. To hear E. B. White read it himself is truly magical. The last time I listened, I thought about how many times it took him to record that last chapter, and it brought him and his story to life even more. Very special to touch his typewriter and nice to know a little bit more about his relationship with Katherine, too. Another great post, Jennie! I love reading your comments, Marcia. Thank you! I had never heard the E.B. 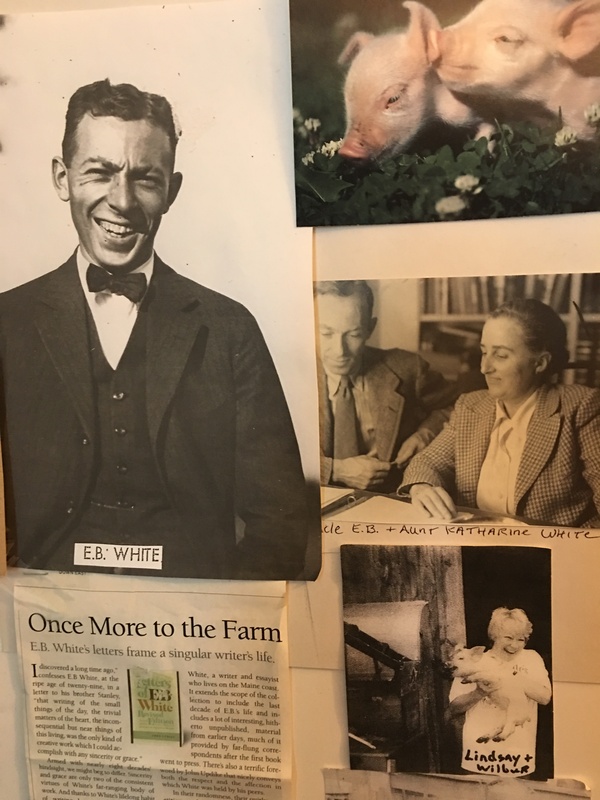 White recording of Charlotte’s Web before. While I was surprised at how he read the words, it was magical to hear him read the book. Then, learning that he was Wilber and Katherine was Charlotte put all the pieces together. Lindsay wants to come to school and hear me read Charlotte’s Web to the children this fall. That’s terrific. Have you read Melissa Sweet’s book, Some Writer? It is terrific! I’m so glad you enjoyed this post, Marcia. Yes, Melissa’s book is one of my favorites! oh this is awesome thanks for sharing. I had never heard of the connection between Wilbur and Charlotte and E.B. and his wife. I feel like I need to go back and re-read the book now. So sweet. Thanks for sharing! I had not heard this either. What a revelation! I’m so glad you enjoyed this.